Elegant vintage styling showcases a timeless design of the furniture industry dating to the 1700’s. The Georgetown Collection features flush case sides, overlay drawers and cut-out front kick plate for a detailed base finish. Available with optional three sided plinth base and various top edges and door/drawer edges so that you may customize cases to meet your resident room specifications. The Highlands Collection is a straight and simple styling that provides a practical solution to resident room furnishing. Stylish full three sided plinth base with crescent front cut-out kick plate offers a full dimensional look. This collection is also available in any of our eight standard woodtones to compliment any room décor. 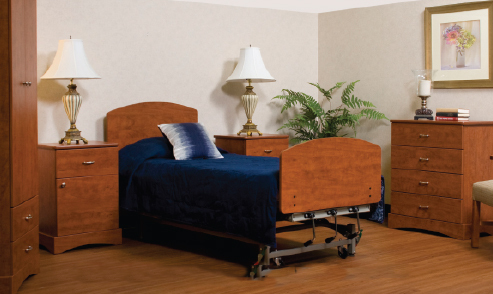 All furniture is proudly manufactured in factories in the USA. All furniture is designed and built using the most modern CNC (Computer Numerically Controlled) CAD/CAM (Computer Aided Design/Computer Aided Manufacturing) programs. This ensures that each piece retains the ultimate in quality control and universality and that our plants offer the utmost in efficiency and cost containment. 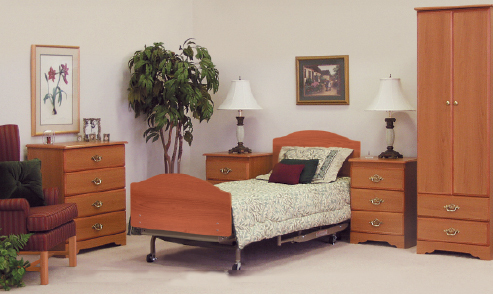 We offer Bedsides in either a Three Drawer Chest or a Door/Drawer Cabinet version. Dressers are available in Three, Four or Six Drawer (horizontal styles). All Dressers and Bedsides feature a vented back to eliminate odor buildup. Wardrobes are available in widths of 6 inch increments from 24” to 48” with no or two drawers (on wardrobes up to 36” wide) and with no or four drawers (on 42”and 48” wide wardrobes). Wardrobes and Bedside Cabinets feature a European style hinge which is pocketed into the door and the cabinet to offer superior strength. These hinges are six way adjustable: for Pitch – up and down; Roll – left and right; and Yaw – in and out. Hinges are a “snap in” style which means that doors can be removed without removing the hinges from either the cabinet or the door. Hinges offer a full 110 degree swing and are self closing. The drawer unit on our collections is our standard composite drawer that offers vinyl wrapped protection to make it moisture resistant. Our standard drawer slide system is a 100 pound test capacity drawer. It also features a self-closing mechanism. Locks are available for all units, but preferably should be ordered with the initial order. Locks are keyed units with two keys per lock. Locks are generally placed on the top drawer of bedside chests or cabinets and on wardrobe doors. They are ordered per locking unit. Master keys are available if ordered with the initial order. Special order or sized cases are also available as many times existing facilities have physical barriers which must be “worked around”. These may be subject to minimum quantities as they require a substantial amount of preproduction and production program changes.